A few days ago I received my first sample of GLOSSYBOX and all of their glory! If you don't know who or what GLOSSYBOX is, then here is the lowdown on them. GLOSSYBOX was launched only last May 2011. They are a monthly subscription service where you pay £10 per month plus (£2.95 P&P) and receive FIVE high end deluxe samples. The box will contain anything from makeup, skincare, body care, fragrances and hair care products. The items chosen will be new or up and coming products which will be on-trend for each season. The idea of GLOSSYBOX is that everyone becomes a reviewer. You have a chance to tell each company what you think of their product. This is great because it helps the companies create products that are of a high standard because YOU tell them how to make it better or keep it how it is. When I read that GLOSSYBOX sends samples, I assumed it would be tiny little samples that last only a couple of days. To my surprise I received some full size products and a few decent sized samples as well. Here is what I received in my December Box. A bit of insight into what products I have received...some light reading. Some big and small samples! How EXCITING! I thought this smelled amazing and a little goes a very long way. The fragrance lasted ages on my skin and I didn't need to put on perfume to mask the smell of the shower gel. My only downside to it, is it isn't very good for dry skin as it has alcohol in it and I felt my skin was a little tight after using it. But this is great, I think, post workout, to cleanse the skin properly and remove all the sweat!!! Also I think the price is quite good for the size of this product! You get a lot for your money. I have used this for a couple of days now and think it is really lovely. It is a waterproof mascara...which I tend not to wear because it dries out my lashes and is typically flakey, but this mascara isn't and my lashes stayed glossy and clump free. I would definitely spend the full price for this mascara. This is a miniature sized gloss to try, the large one, I assume is quite a bit bigger. The gloss is nice as it's not sticky. I tend to hate wearing lip glosses because they can be so gloomy. This one sits nicely on the lips, the colour is opaque and lovely and shiny. I don't think the price is too bad for what it is. When I first saw it was £10.00 I sort of thought 'NO WAY', but after trying it for a few days I think it is worthy of that price and I think it will last long enough for you to feel like you are getting your money's worth! This nail varnish is really beautiful. It takes a few coats to get an opaque sparkle going, but once on, it is beautiful. The sachet, nail varnish remover is lovely as well. My only concern are the prices. I am not one to spend £16.00 on nail varnish and/or remover. As lovely as they are, not all of us can afford such luxuries for our little fingers. I think if you want to splurge, I could think of a few other things you could get. I'd buy a new mascara, a good foundation or save my money and put it towards the JURLIQUE product I'm about to discuss. The other day, just before I received these, I bought a MaxFactor nail varnish in gold glitter like this red one and it was amazing and a fraction of the price. I LOVE THIS. I have been doing a new skin regime...and I have now substituted my Boots Vit E oil for this JURLIQUE cream. It works similar to the Advanced Night Repair from Estee Lauder I am always going on about. Because it promotes the regeneration of elastin, collagen, and new skin cells. So I am using it in conjunction with my other skin regenerating products. It is supposed to firm and lift. I have only been using it a few days , but what I can tell you is I have had next to no sleep this last week, due to my little boy and teething! I have had some MAJOR eye bags going on and when I tap this lovely product onto my skin the puffiness goes away, my bags shrink down and my skin doesn't feel so drab. I think it is worth saving a little bit of cash and splurging on something like this. Our face is the first thing people see and you want to leave a GOOD lasting impression. So I highly recommend it. Hope you enjoyed!! I definitely have...I think I will HAVE to sign up for GLOSSYBOX. The products you get for a mere £12.95 with postage is actually a great bargain! You get to try out things you have never used before or even heard of. 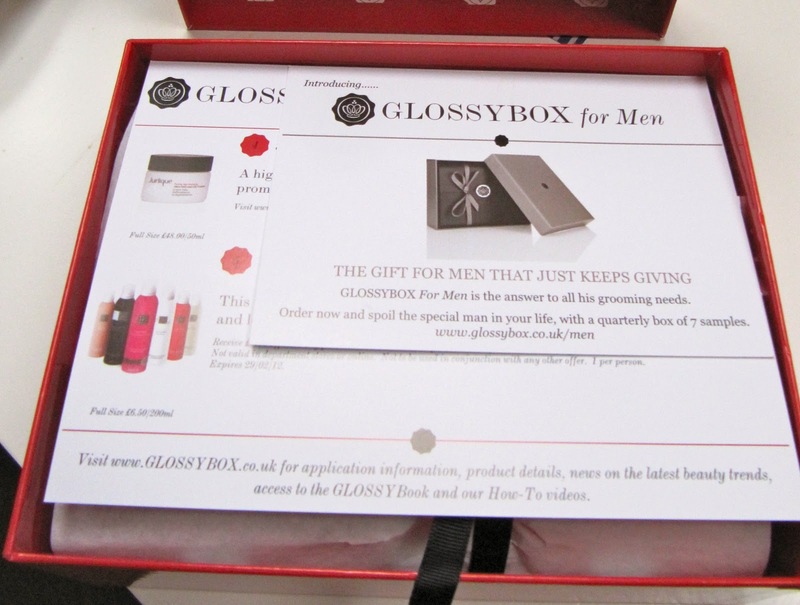 ALSO, before I forget the men also have a GLOSSYBOX...so boys, go and sign yourself up, or girls...get this lovely box for the boys. This box is shipped out quarterly with 7 luxury men's grooming products!